Poly High School microeconomics student Eric Gorzeman surpassed 9,000 students to win the national InvestWrite essay competition recently. The victory at the spring competition followed Poly classmate Braxton Greco’s national win at last fall’s contest. The competition is sponsored by the Foundation for Investor Education, a program of the Securities Industry and Financial Markets Association (SIFMA) Foundation. Award criteria include whether the student exhibits knowledge regarding the concept of researching and planning an investment strategy. Students must demonstrate an understanding of the core concepts of the stock market. Each semester more than 9,000 students participate in the national essay competition as an extension of the Stock Market Game, produced by the SIFMA Foundation and supported by Morgan Stanley. Poly juniors Gorzeman and Greco entered the fall and spring competitions as members of Dan Adler's Advanced Placement microeconomics class. Gorzeman also placed fourth nationally in the fall before winning first place this spring. As national winners, both students and their teacher will travel to New York City to tour a variety of financial institutions and interact with business leaders. 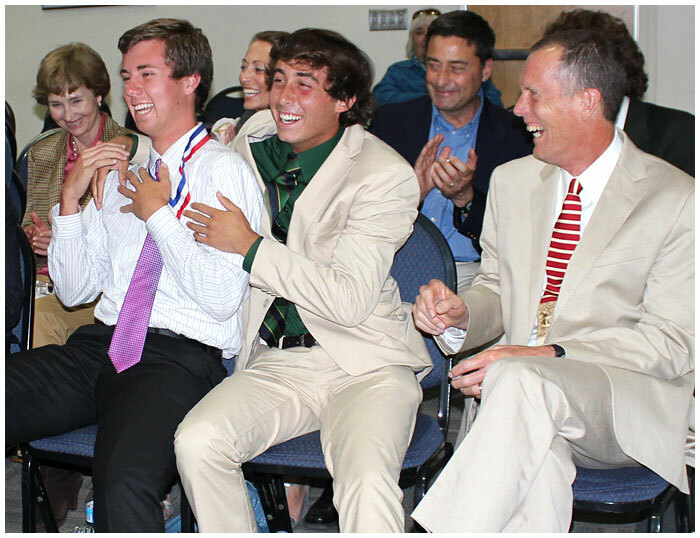 THE THRILL OF VICTORY – Poly High School economics students Eric Gorzeman and Braxton Greco exult upon learning that Gorzeman surpassed 9,000 students to win this spring’s national InvestWrite essay contest in which students demonstrate their mastery of the stock market. Greco took first place in the same contest last fall. The students were honored at the Los Angeles Chamber of Commerce.